The Buffalo Gap project is in the Abilene-Sweetwater corridor, west of Dallas-Fort Worth, one of the fastest growing wind generation areas in the world. The leadership role of the State of Texas in wind power is being reinforced with the 524 megawatt Buffalo Gap Wind Farm project, which will be among the largest wind farms in the United States. It may seem a bit ironic, but the State of Texas-home to some of the largest energy companies in the United States and considered by many to be the home of the oil and gas industry in the U.S.-has now become a leader in alternative energy. The state has been far and away the leader in terms of installed wind power in the U.S. in recent years (see sidebar story page on 8). In fact, the world's largest wind farm has been proposed for the Texas Panhandle, on a site northeast of Amarillo. Mesa Power, owned by T. Boone Pickens, wants to build as many as 2,000 turbines on a wind farm that would spread across nearly 200,000 acres. And just as many traditional energy companies, such as BP and Chevron, have entered into the alternative energy area; the industry has also seen many power companies directly make the move into wind and solar power. AES Corporation is one of those independent power producers which has made some significant investments in alternative energy, including in Texas, in recent years. While it is based in Arlington, Virginia, AES is truly a global operation, with some 121 power generation plants in 28 countries around the world. Its facilities have the capacity to generate approximately 43,000 megawatts-and the company itself generated revenue of $11.6 billion in 2006. And AES intends to roll out its wind energy strategy on an international basis. "This expansion is consistent with AES's long-term goal to be a major wind energy producer, and is part of our plan to more than triple our wind-generated megawatts globally by 2011," says Willam Luraschi, AES executive vice-president and president of alternative energy. "As one of the cleanest, lowest cost renewables, wind generation will be an area of continuing focus and priority for AES." One of the largest energy ventures the company has been involved with in recent years has been the Buffalo Gap project in Texas. When completed, the 524 megawatt (MW) project will be among the largest wind farms in the United States. The company is currently wrapping up construction on phase three of Buffalo Gap, a 170 MW expansion. Ned Hall, president of AES Renewable Generation, explains that AES became involved with the Buffalo Gap project-the company's first wind generation project-through the purchase of California-based SeaWest Wind Power Inc. It was truly a strategic acquisition, says Hall. "When we decided to enter the wind business, we recognized that AES already had core competencies that covered 90 percent of the skills that we needed to be successful-but that last 10 percent is really unique to wind power." These include the specific skills on how to efficiently build and operate wind power generation facilities. AES, with its dozens of power generation facilities, certainly had core competencies in traditional power plant development. By acquiring SeaWest, they were able to bring a company into the fold that had been involved in wind power since the early 1980s. SeaWest had a number of wind power projects in operation, and more in the pipeline, including Buffalo Gap. Hall says that AES has been very active in wind power acquisitions in the last several years, making 11 different transactions in the wind power area. "But SeaWest was probably the most pronounced in terms of the impact it has had on our efforts in wind power." When AES acquired SeaWest, Buffalo Gap was envisioned as a modest sized wind power project, at 120 MW, made up of 120 Vestas V80 turbines. But that was quickly followed by a second phase, which went commercial in 2007, involving an additional 233 MW using GE turbines. The third phase of Buffalo Gap, 170 MW employing Siemens turbines, is now under construction. "And we're still not done," says Hall. "We'll expand the site further, as conditions warrant." Buffalo Gap has been expanded, and will expand in future, as transmission capacity grows, he adds. "One of the reasons we find Texas attractive is its commitment to renewable energy as demonstrated by the willingness to invest in transmission capacity to support the growth of renewable energy throughout the state," says Hall. "We believe that Buffalo Gap is going to be a good long-term growth opportunity going forward because it is one of the areas in Texas that has been identified for further transmission system upgrades." Buffalo Gap is in the Abilene-Sweetwater corridor, west of Dallas-Fort Worth, which Hall says is one of the fastest growing wind generation areas in the world. Essentially, it's a very attractive wind resource area in what is a very wind resource-rich state. All of this makes for an appealing package. Hall notes that AES has an additional 1,000 MW of wind power planned for Texas, in addition to what is already in place with Buffalo Gap. Texas is also at the top of the list for wind projects for many other companies. While the state may be considered "wind power friendly," Hall explains that each project still has an approval process to go through. "We do complete and extensive environmental studies for all of our sites," he says. "There is a very well defined process that you go through in Texas, and we went through a review that involved the county governments. We did a lot of interfacing to explain what we are going to do." A key constituency with any wind farm project is the landowners. "We spent a lot of time meeting with them and putting in place a process that keeps them informed and honors their commitments and concerns. That's important, because these landowners will be continuing on with what they were doing before with the land, after the wind farm is built." As part of the process, some areas at Buffalo Gap were identified as nesting areas for bird species, and the siting of turbines and construction was managed to minimize any impact. AES also identified any potential historic sites, anything that might have any archeological significance. Hall says that the company has Mike Azeka, one of the leading experts in the area of wind environment and permitting, on staff to help it work through the approvals process. For the third consecutive year, Texas was the nation's leader in the amount of wind power added to the grid in 2007. Nearly $3 billion worth of wind-powered generation was installed in Texas during 2007, growing the state's total wind capacity by 59 percent, according to industry group, The Wind Coalition. Texas' 1,618 megawatts (MW) of new wind power installations were more than twice as much as were added in any other state during this record-shattering year for the U.S. wind industry. The American Wind Energy Association reports that at the end of 2007, 4,356 MW of the nation's 16,818 MW were operating in Texas. The state's wind generating capacity represents 26 percent of all wind power installed in the U.S.
"Texas leaders have done an excep-tional job of at-tracting the wind industry, and with steady federal support and access to new transmission lines, wind power can continue to thrive," says Mike Sloan, managing consultant of The Wind Coalition, a regional wind advocacy group operating in the south central United States. And there is more to come. According to the Electric Reliability Council of Texas (ERCOT), there were 3,064 MW of signed commitments made during 2007 to build new wind power plants-a level that is greater than for any other type of new power plant. ERCOT is currently developing plans and cost estimates for new transmission lines that could support much higher levels of wind power in the future as part of the Competitive Renewable Energy Zone process, which is expected to be finalized during 2008. 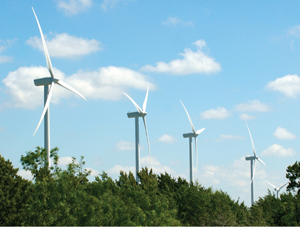 Texas' record-setting year of wind power development represents about 10 percent of all power plant capacity completed in the United States during 2007. "We also work with external consultants, too," he adds. "Typically, you have to map the wetlands on your site. In just about every jurisdiction you go to in the U.S., there will be local consulting companies that have strong expertise on the local flora and fauna. So it is a combination of our internal experts and leaders working with the right external consultants to get approvals for the right location." Hall says that with the environmental issues addressed, Buffalo Gap has proven to be an "excellent" site for construction of wind power generation facilities. "We have an excellent relationship with the contractors in the area and we have been able to source the resources to get the phases built on schedule and on budget." With such a huge project, AES had all the components lined up well in advance. Hall notes that AES, which is working towards being a global wind power player, enjoys a strong relationship with a variety of turbine supplies, including GE, Siemens, Mitsubishi Heavy Industries and Vestas. They recently signed a multi-year contract with Vestas for delivery of 52 units of the V90-3.0 MW wind turbine. The contract includes delivery, installation and commissioning of the turbines, as well as a five-year service and maintenance agreement. "What works with those companies is that they-along with AES-have global strategies, and are focused on growing globally." The company's construction approach with wind farms-in terms of the role it takes-is site specific, Hall explains. "We don't have a one-size-fits-all approach. It depends on the location, the project and what is going on in the market. But we'll have a site manager in charge of construction and a team of about 10 people who will supervise the construction on behalf of AES." The company might act as general contractor on a project or, as in the case of the Buffalo Gap project, hire a general contractor. D. H. Blattner and Sons and Renewable Energy Systems (RES) were the general contractors on Buffalo Gap.In terms of construction, phases one, two and three have been separate construction projects, but AES has tried to achieve, where possible, somewhat of a continuous construction flow with Buffalo Gap. With the tremendous growth-and interest-in wind power, companies involved in building wind farms, such as AES, have developed their own processes for managing a large number of projects-and identifying which projects get an early green light. "We don't have unlimited resources, so like other companies, the proposals are put forward and then prioritized based on what is best for our stakeholders, which in the case of an investment decision are primarily the shareholders. "We start off by analyzing the business opportunity, and we tend to emphasize places where AES already has a presence, with people in place that can support our business development, construction management and operating efforts," explains Hall. The company has a significant presence in North America and the UK, so initial efforts have been directed at those two countries. But, Hall emphasizes, they are also looking at new markets, such as France. "We also focus on the markets where there is government or legislative support to promote renewable energy," he adds. Hall believes the future for wind power is very bright. "Wind power is high growth-it's growing at 20 to 30 percent a year in almost all the markets where there is an opportunity, and there are new markets opening, both in the U.S. and internationally." The State of Texas-home to some of the largest energy companies in the United States and considered by many to be the home of the oil and gas industry in the U.S.-has now become a leader in alternative energy, with projects such as the Buffalo Gap wind farm (above). There seems to be general agreement that wind power could generate 10 to 20 percent of the electrical power required in industrial countries. "Globally, we are at significantly less than one percent wind generation today," notes Hall. "So there is a huge growth opportunity around the world in wind generation. It's going to take us a long time to get to that 10 to 20 percent. "And that fits the strategy of AES very well, to be a global wind power company." The company's history as a traditional power producer also fits quite well with the move into wind power, Hall believes. All power projects, regardless of whether they involve a dam, a coal power plant or wind turbines, have some common elements. They involve identifying the right location, working with local communities and government to move projects forward, and securing the necessary resources to get the job done. "AES has significant experience in managing large and complex construction projects, and in ultimately operating these projects," adds Hall. "We are very focused as a company on being a top decile operator in all our businesses, and creating real value and opportunity. That is a strength we try to bring the wind business as well." Going forward, Hall says one of the main challenges the wind power industry faces is, simply, people. That involves identifying, attracting, hiring, and training people to support the growth in wind power. "It really does all depend on having high quality, talented people to drive the development, construction management and operation of these wind facilities." n addition to hiring people to handle the growth on the wind power side, AES is working to best utilize the 30,000 people it already employs, giving them opportunities to be part of the company's plans to grow significantly in wind. The other big challenge, with the pace of growth, is obtaining the turbines and associated equipment to build and operate wind farms. These resources are in short supply. But Hall says it looks as if that issue is in the process of being resolved, with ongoing expansion efforts on the part of existing suppliers, and new suppliers coming on stream, such as from China, Korea and Brazil. "The shortage of materials has definitely been a constraint on the industry, but that issue is in the process of being resolved."